After the recent pink overload, I was looking for a project in a different colour. I started a new spinning project for the Bettina’s Pegasus SAL in the MirkwoodArts group (more about that later). 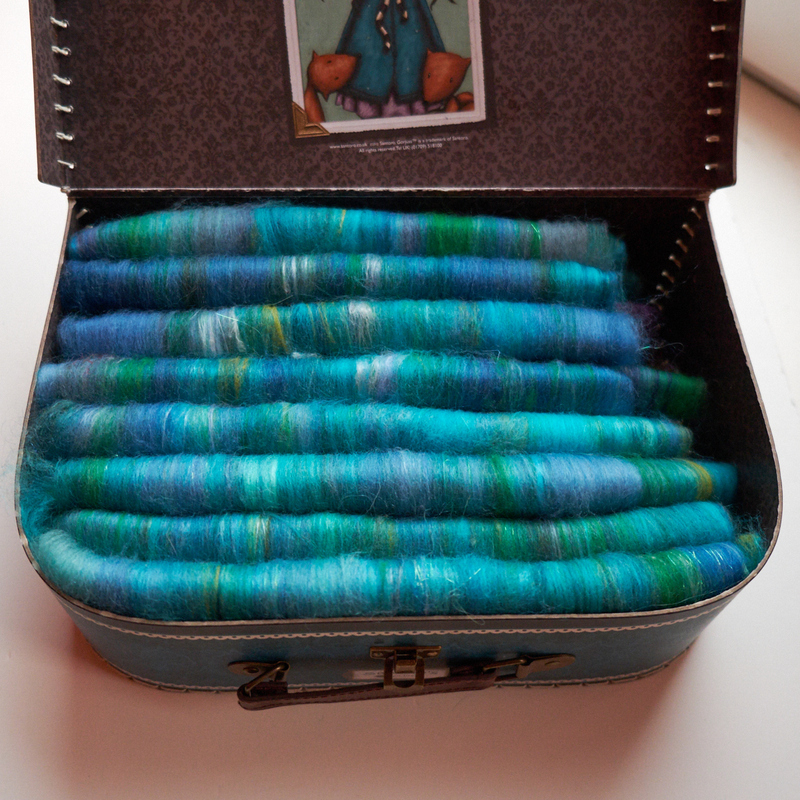 This SAL goes on until the end of December, but I will update once I have spun this blue-green project. 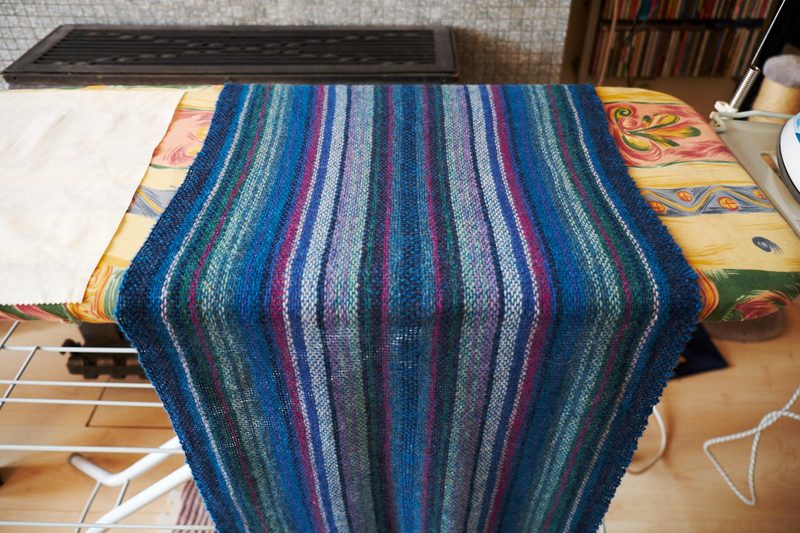 I also wanted to weave another shawl. The previous one, while really lovely, is a bit short for my neck. I can wear it around my shoulders, but it isn’t really fit for the cold weather we’re having at the moment. It has been very clear lately, with lots of sun, so the nights have been colder than what is normal for November. Additionally, they are predicting that the cold weather will stay in place for a while (perhaps even with a bit of (wet) snow), so I need winter woollies! I decided to weave a longer shawl this time, made out of the same yarn (Wol met Verve Supersoft) as the previous shawl. 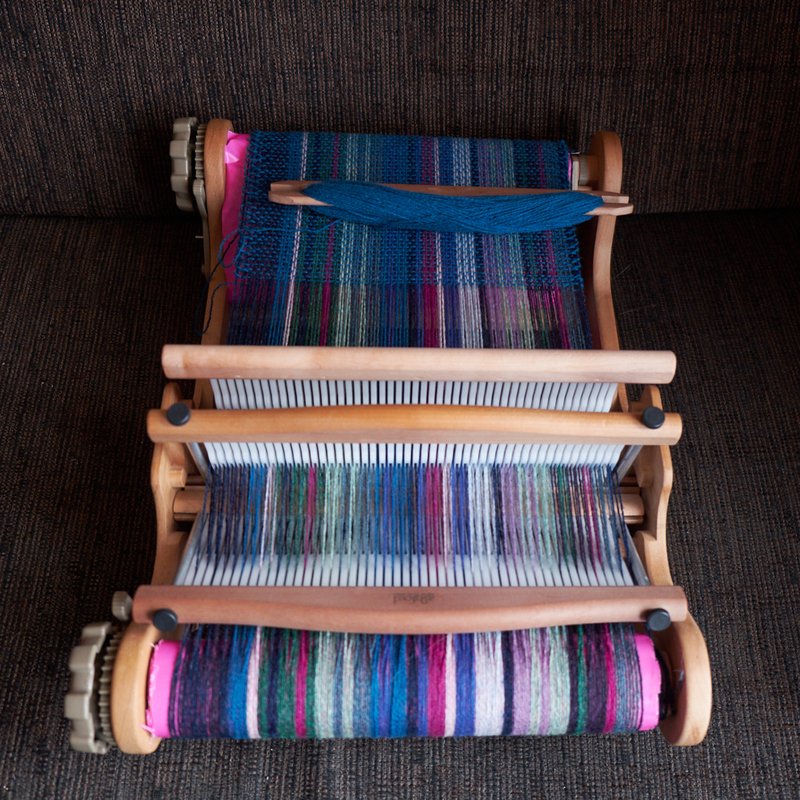 However, I would focus more on blues and greens in the warp (hey, there’s a pattern here! 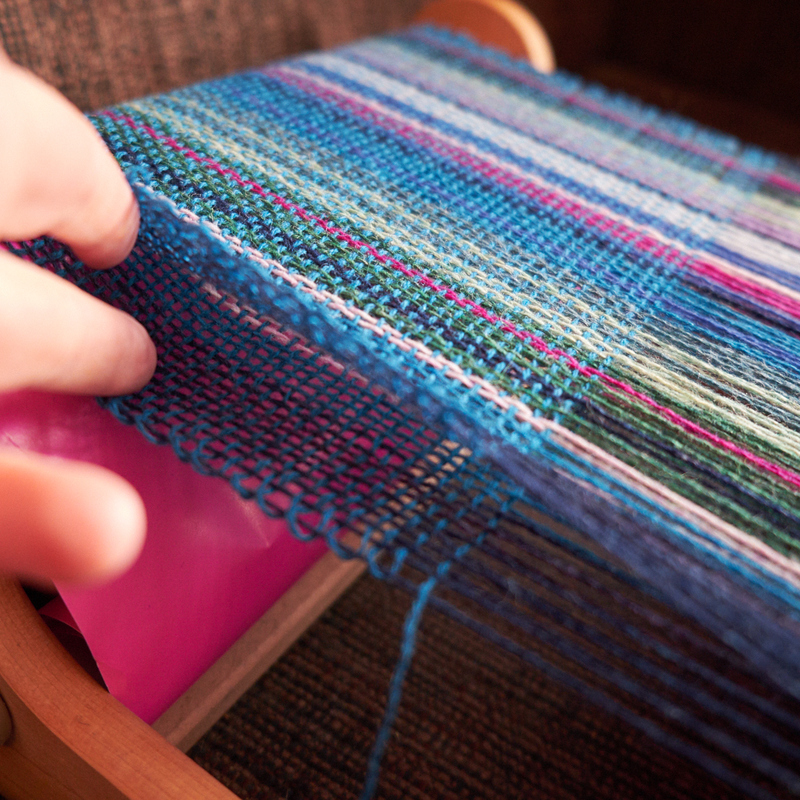 ), and the weft colour would be a shade of blue. Being the colour lover that I am, I couldn’t resist adding some specks of purple and pink into the mix. They mix well with blue, and perhaps they would liven up the shawl a bit. 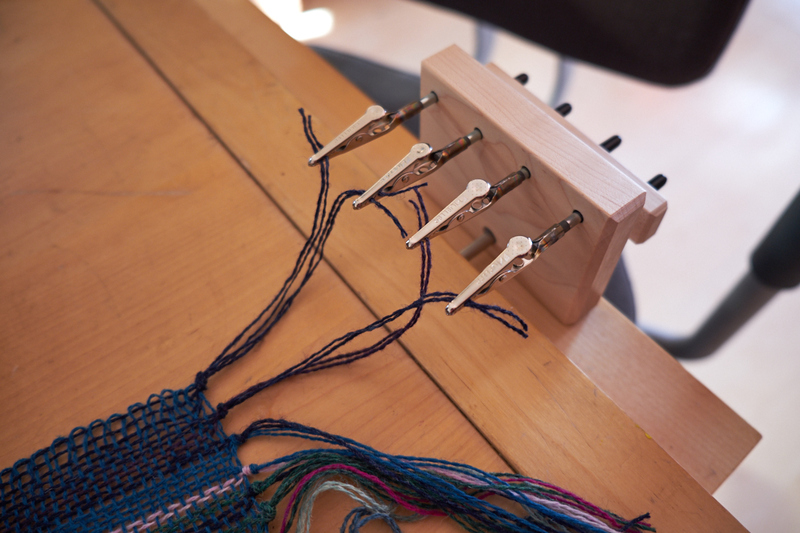 I threaded the loom just like the last time, using three heddles for double weaving. I picked a nice blue, almost petrol, because I expected it to play well with both the blues and the greens. 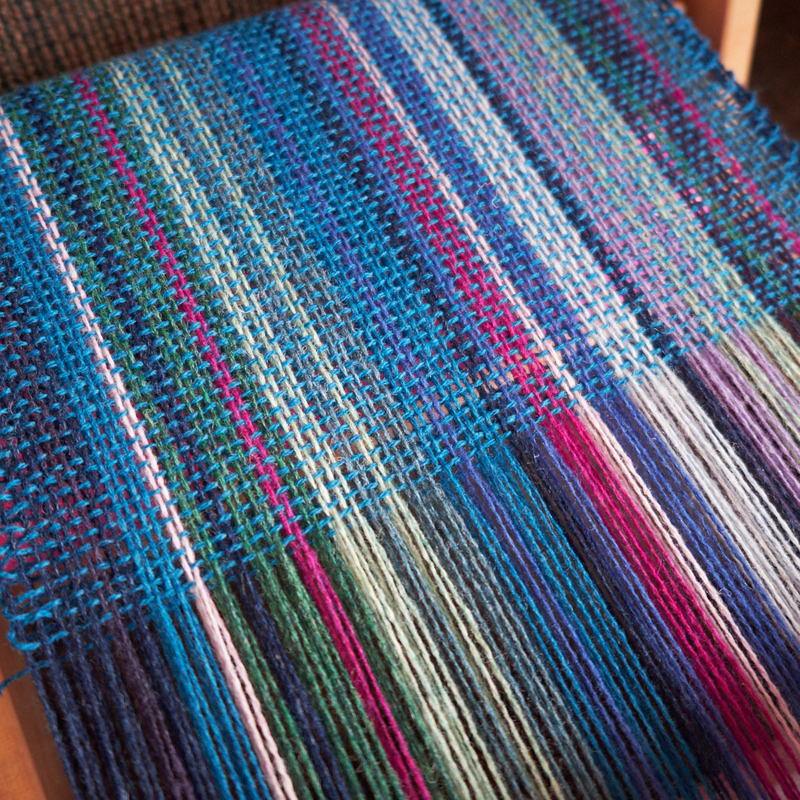 Then I started weaving. 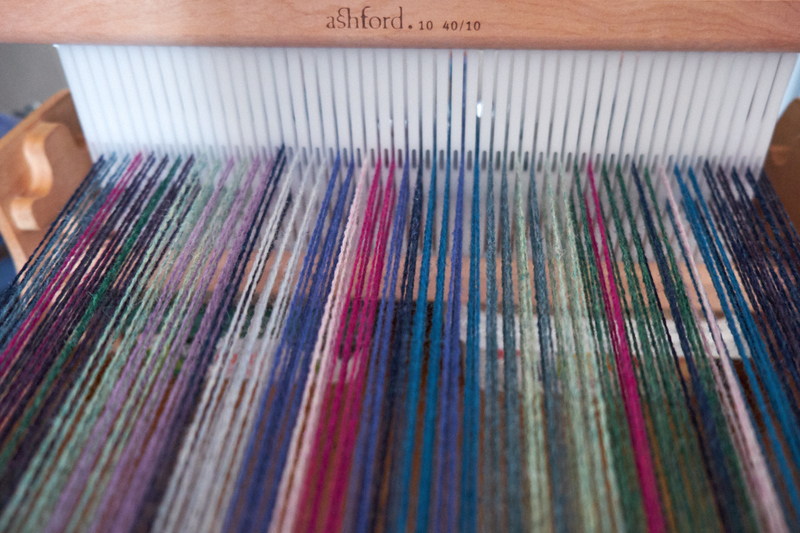 It’s interesting to see how the weft really transforms and subdues the bright warp! If you look at it closer, you still see the separate colours, but from a distance, the blue dominates and the other colours blend in. 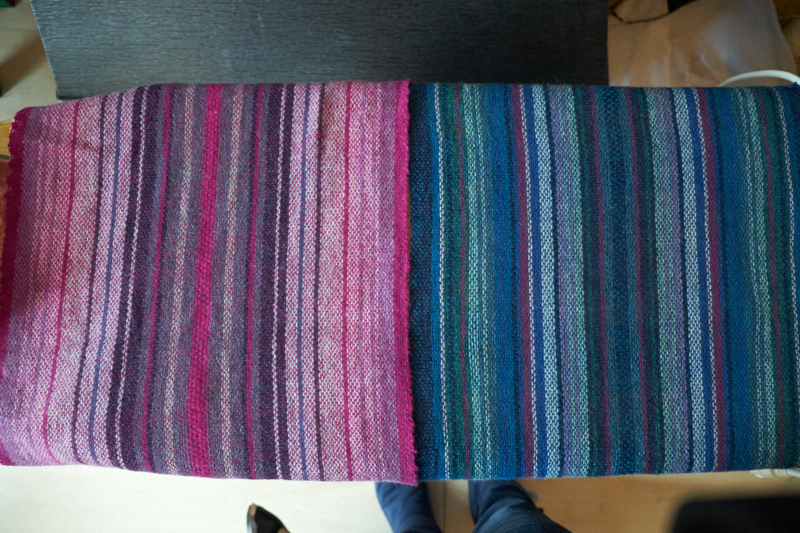 I finished the shawl last Saturday evening, and compared to the finished pink shawl, it looks quite different. Here you can see how much of a difference the finishing makes. The fulling shrinks the fabric, but it also makes the wool bloom and it softens it. 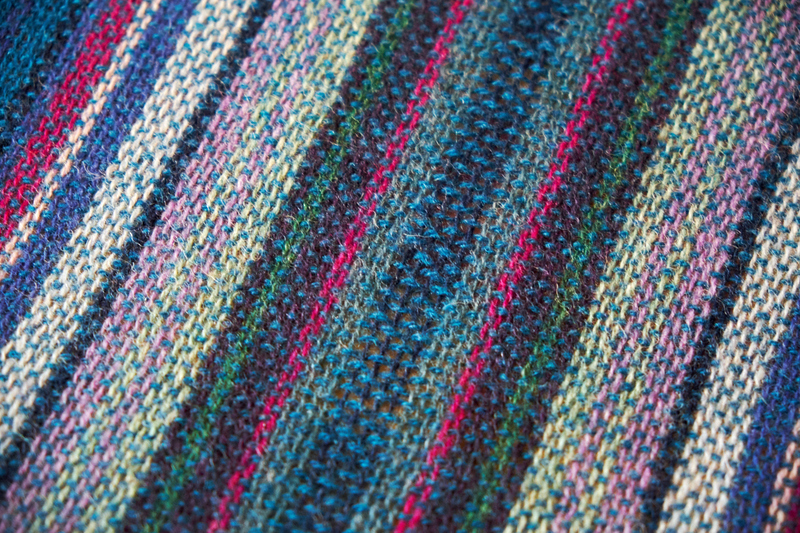 It’s hard to see that there’s blue and green in the pink shawl too, isn’t it? I created a twisted fringe again, because I was going to full the fabric. I expected that the fringe would become a mess if I started fulling it as-is. Twisting the fringe is not hard, but it does take some time. Fortunately, I have a little tool for it! Then I fulled the shawl. It bloomed up nicely! The center is a bit loose (again), but I don’t mind that. 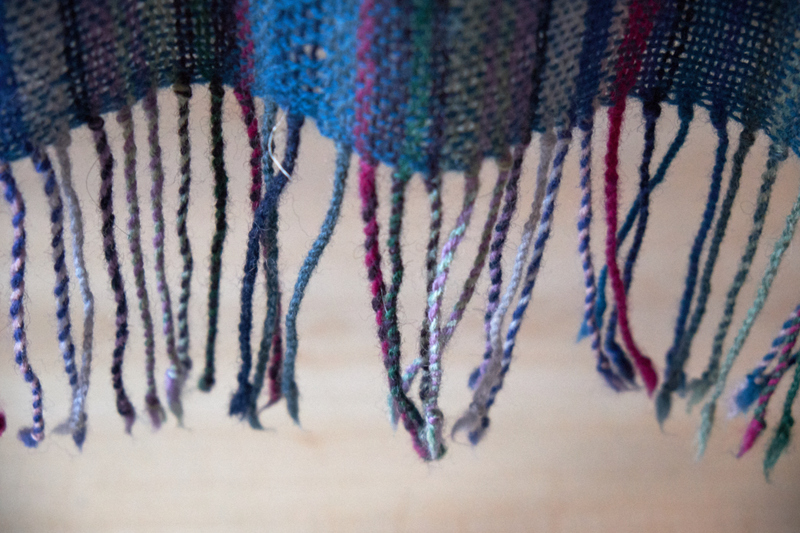 When looking from close-by, the shawl is quite multi-coloured. But when stepping back a bit, you can see how blue it really is! The green is still there, but darker, and the pink almost looks purple! Here you can see it even better. 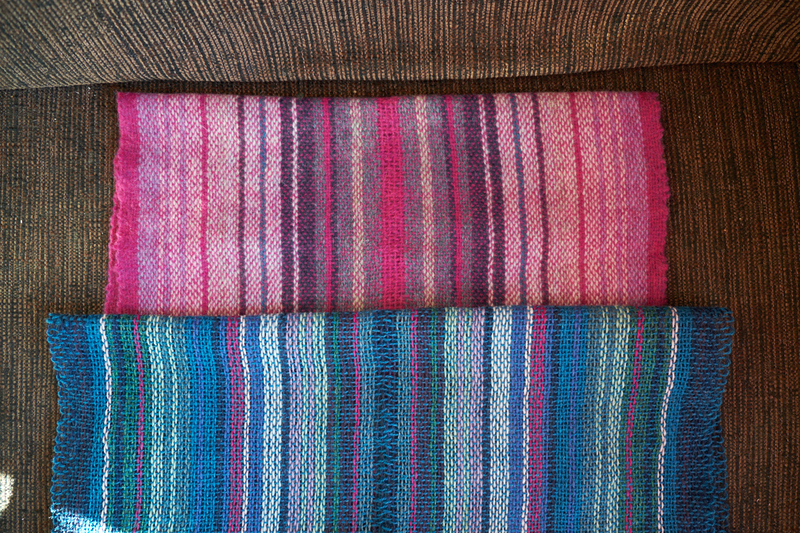 The pinkish stripes in the blue shawl are the same pink as the bright pink in the middle of the pink shawl. Next to that pink in the pink shawl is green, which is also in the blue shawl, where it does look like green. You can still see the original colours in the fringe (more or less). I’m very happy with how this shawl turned out. It is 42 cm wide and 176 cm long, a much better size than the pink one. I could even full it a bit more if it’s too loose in places.